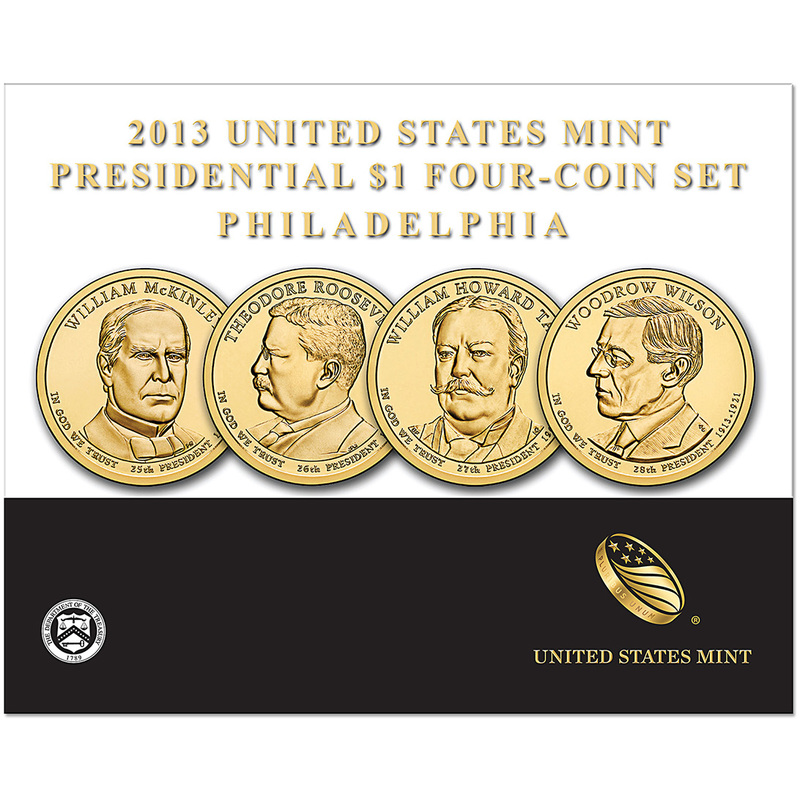 Available beginning today, August 15, 2013, at Noon (Eastern), the United States Mint will release the 2013 Presidential $1 Four-Coin Sets. 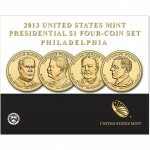 These sets each contain circulating quality versions of the 2013 Presidential $1 Coins, although the coins have never actually been issued into circulation. Buyers have the choice of a Presidential $1 Four-Coin Set containing strikes from the US Mint's facility in Philadelphia or a set containing strikes from the US Mint's facility in Denver. Of note, the packaging allows for the easy removal of the coins for inspection or placement in collector albums. As mentioned, each of these coins are struck to circulation quality, although none of them have been issued into circulation. 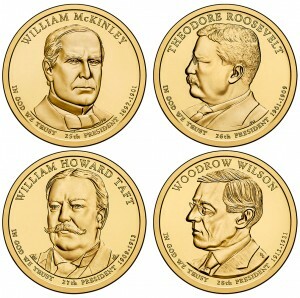 The four Presidential $1 Coins listed above represent the 25th through 28th releases in the series as well as honor the 25th through 28th Presidents of the United States. The Presidential $1 Coin Program debuted in 2007 and honors the former Presidents in the order in which the individuals served in office. 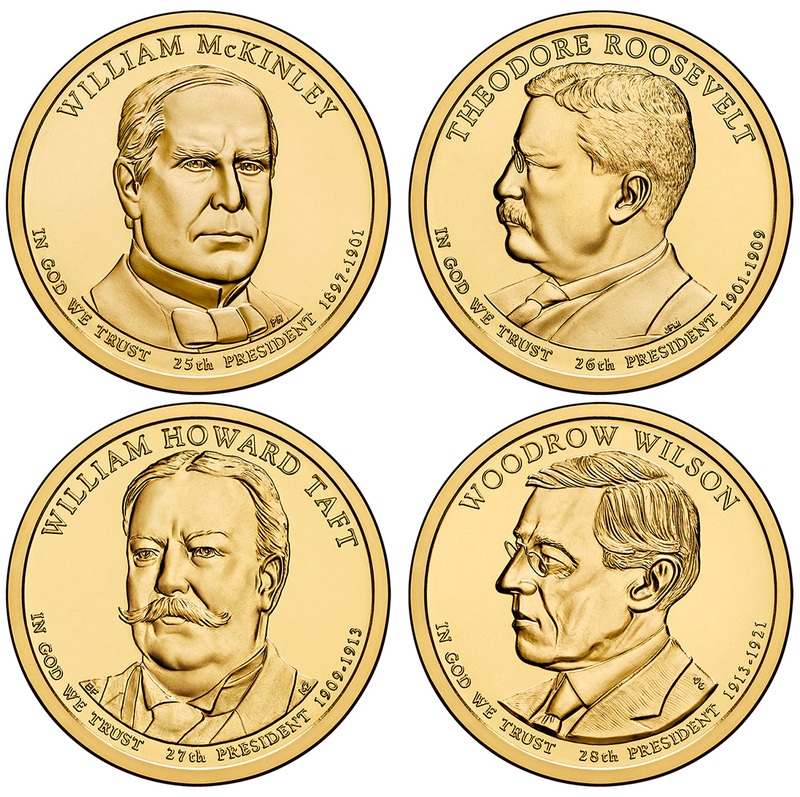 Obverse designs include the portraits of the Presidents and correlated inscriptions including their name, the order in which they served and the years in which they served. Also inscribed on the obverse is IN GOD WE TRUST. Shown on the reverse is a rendition of the Statue of Liberty by United States Mint designer/engraver Don Everhart. Inscriptions include UNITED STATES OF AMERICA and $1. An edge inscription on each piece reads "2013," "E PLURIBUS UNUM" and the mint mark. The 2013 Presidential $1 Four-Coin Sets are available now. Orders are accepted via the US Mint's website of www.usmint.gov, or by calling the United States Mint at 1-800-USA-MINT (872-6468). Of note, the United States Mint is currently offering free standard shipping on most products ordered between the period of July 26th through 5PM (Eastern) on September 30, 2013.